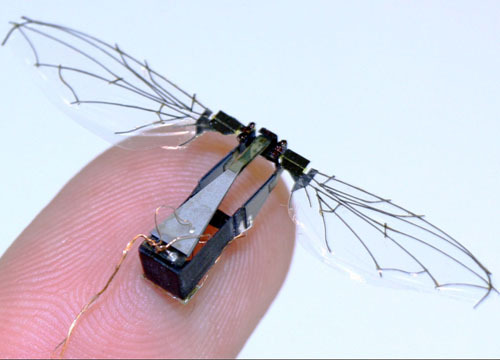 This tiny robot is inspired by the common fly. While humans have been trying to build larger and larger flying machines that can carry more and more people and cargo, even more challenging has been the task of creating very small machines that can be controlled remotely and can fly in tight spaces. In the past few years, Robert Wood and his team at Harvard have developed a robotic fly, inspired by the common house fly and looking very much like its natural counterpart. Wood became interested in a project like this in the 1990s while a graduate student at the University of California at Berkeley. The first step in the project was to research in depth the precise movement of insects like bees and flies. The team then had to figure out how to mimic the small, intricate movements and parts of the fly. They took into consideration the rotational motion of the wing during the upstroke and downstroke, the shape of the wing, and whether two or four wings would be better. Since they were pioneers in this field, there was no previous work for them to use when designing their tiny robot. Also, the team had to design the machines that would make the parts for their robot because there were none available that were specifically equipped to manufacture such special parts. After all the preparation was taken care of, the team could finally start to assemble their tiny robot. Their final product weighs 60 milligrams and has a wingspan of 3 centimeters. A small actuator moves the wings, which are made of polymer and carbon fiber. The actuator is actually more efficient than the muscles of the fly. The power output per unit mass of the man made actuator is 5 times more than the natural muscles. As of 2008 when the initial report of this work was first published, the Harvard team was still working on designing an on-board power source for the robotic fly. It is currently powered by electricity from a thin wire, which severely limits the range of motion and independence of the robot. Wood envisions using his robot for search-and-rescue missions and the like. He wants to study how insects like ants form group structures and use this research to program his little robots to fly in formation and work together. In fact, the researchers at the University of Pennsylvania’s GRASP laboratory may be able to offer some help in this department. They have developed small robots that fly with four rotors like on a helicopter. These they have been able to program to fly in complex formations and together manage obstacles they may encounter in flight. While the robots themselves are not inspired by biological designs, their formation flight is reminiscent of that seen in some flies and birds, and the same technology could be used by Wood’s team at Harvard to achieve their goal of formation flight. Only days ago, the National Science Foundation released a highlight of Professor Wood’s research. Watch the new video! Wow, that gives a good comprehensive look at the whole project! Too bad it wasn’t out before the blog was due. Thanks for sharing!